The night had finally come, it was January 22nd, 1994 and it was Royal Rumble time. 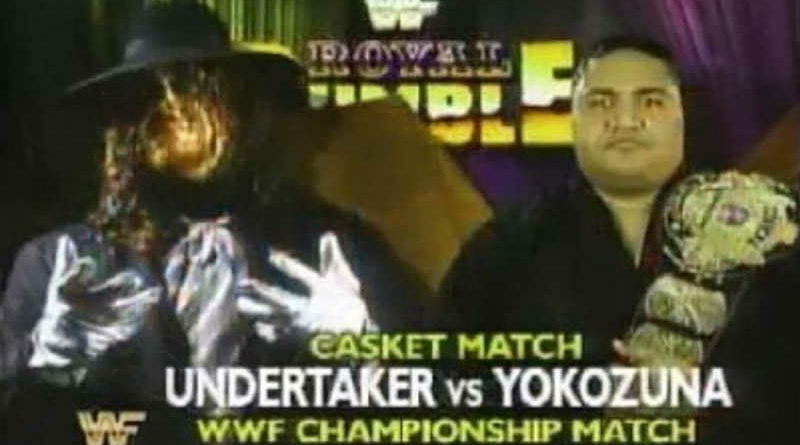 More importantly, it was time for the first casket match featuring the unstoppable Yokozuna and the even more unstoppable monster, The Undertaker. 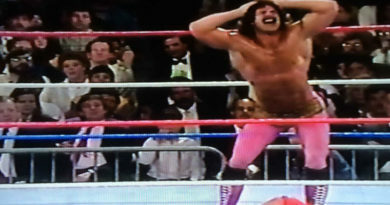 This is a great follow up to the recent article on Bret Hart’s night at the 1994 Royal Rumble. 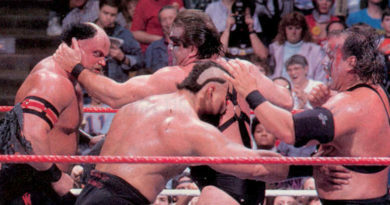 Technically Undertaker fought Kamala in a casket match in 1992; however, this match was the first time that the winner would be decided by being placed into the actual casket, whereas the first match was decided via a pin fall and Kamala was then placed into the casket after the match was over. 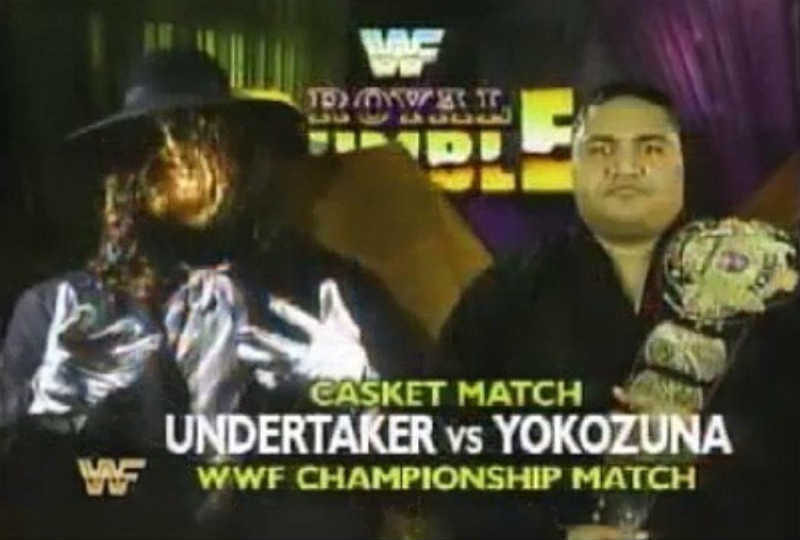 For months I have seen The Undertaker taunt Yoko in videos where he was building the double-wide, double-tall casket. I remember thinking how The Undertaker’s voice sounds just like an evil villain in a movie. My son came downstairs while I was re-watching this match and he immediately declared that the wrestler in the black outfit (Undertaker) was the bad guy and the wrestler in the red (Yoko) was the good guy. Even though Undertaker was a fan favorite, it wasn’t immediately obvious. Perhaps he was one of the pioneers of bad guys actually being good? Ding, ding, ding, the bell finally rings signally the beginning of the match after The Undertaker slowly walked to the ring with Paul Bearer pushing the casket and leading the way. The Undertaker begins attacking Yokozuna, charging off the ropes several times, landing multiple clotheslines. Yoko begins reeling back-and-forth and finally goes down – this must be one of the few times that Yoko was actually knocked down by force. It must have been ironic for The Undertaker not being able to knock down someone, as wasn’t Undertaker the one who never got knocked down? The match then spills to outside the ring and a steel chair gets involved. Yokozuna lands multiple chair shots to the head and The Undertaker appears on his death throes on the floor. As I recently re-watched the match, I don’t recall seeing many chair shots to the head in the early 90s, this may have been a start to a vicious trend of the Attitude Era later that same decade. In typical Undertaker fashion, he sat up and regained control as the match resumed in the ring leading to an eventual choke slam by ‘Taker on Yoko. Perhaps there was about 1 inch of clearance by Yoko’s second foot before hitting the mat – man Yoko was absolutely huge! 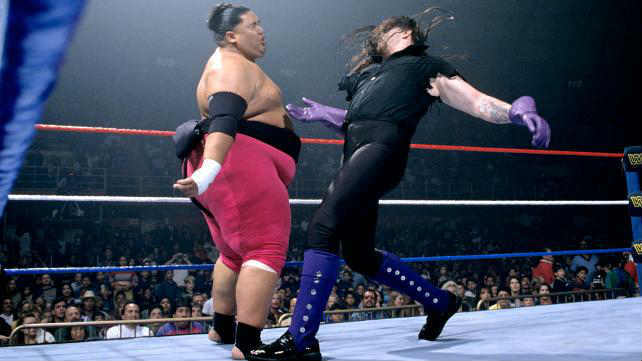 Yokozuna lay motionless, it was time for Undertaker to win the match! He slowly rolled Yokozuna into the casket. As the Undertaker was about to close the lid, Crush came running down the aisle attacking Undertaker and preventing him from closing the casket. As Crush was preventing ‘Taker from winning, three more wrestlers came rushing down to join in the attack. Two more wrestlers came down to the ring, but this didn’t stop the Undertaker from making a comeback. Three more wrestlers also made their way to the ring (including Diesel) bringing the total to nine wrestlers attacking The Undertaker. Undertaker is finally placed into the casket. At the same moment, Yokozuna attacks Paul Bearer, stealing the urn from him. After Yoko uses the urn, he throws it down where the lid comes off and green smoke begins spewing forth. Before the casket is closed, Undertaker escapes with the power of the urn to make a final comeback. Unfortunately, the comeback was cut short as the combine might of the 10 wrestlers were able to overcome ‘Taker laying a merciless beat down. In turn, one at a time, each wrestler would land a big move on the Undertaker until he was no longer able to get up. Finally, several of the wrestlers carried Undertaker to the edge of the ring where unceremoniously Yokozuna finished off the dead man pushing him in to and closing the casket, securing his victory, retaining the WWF Heavyweight Championship. This marked day 223 of Yokozuna’s incredible 280 day title run. As the wrestlers were rolling the casket to the back; everyone, including me, thought we had seen the last of The Undertaker when suddenly, “the gong” of the Undertaker’s music begins. Everyone quickly abandons the casket, where it, like the urn, begins spewing forth more green smoke. After this match, The Undertaker didn’t appear again on WWF TV until the great Undertaker vs Undertaker match at the 1994 SummerSlam main event. The Undertaker had a severely injured back and required a lengthy period of time to recover; including missing Wrestlemania X. Copyright © 2019 WWF Memories. All rights reserved.